Do we have many Riptide owners? What I would like to see is a selection of serial numbers to see if there is a date code contained in them. For instance, would 60 6050 mean 1960, the sixth month and serial number 50? Some, it seems, were prefixed SS. I would be happy to receive emails if you want to communicate privately. SS prefix was denotion for the "Sea Scout" model with the sand cast, two piece tank as pictured. Generally the tanks rotted away very quickly. PM Me with your email address, let us talk Rippers Mate! Hey you two, don't keep any secrets, Let me know if you get any interesting news for the Riptide news letter. I'm sorry, but this is highly classified information. On a more serious note, we haven't got to any in-depth info exchange yet. From my end it will not take long! What is the Riptide Newsletter? I'm sure The Chairman won't mind if I post a photo of one of his Riptides ,which I am holding for him in Sydney, resting alongside some of my Old Marine Engines with which you are familiar . I would tell you it's serial no. but I do'nt know where to look ? senojn, that's a good shot of the Riptide. I presume the inboard on the right is a Chapman Super Four. What interests me is the what looks like a name plate with Chapman in an oval. Is that cast into the mounting lug or is there something else lying on it? Photoshop refuses to make this clear! 'tis a good shot of David's Riptide with the reflections . You're extremely observant to notice the Chapman plate . The motor is the 4 1/4 hp Super pup .Early one with the evaporative carby and horseshoe magneto. The plate is brass and they were actually cast for the Chapman boats so I just filled in the green and sat it with the motor. 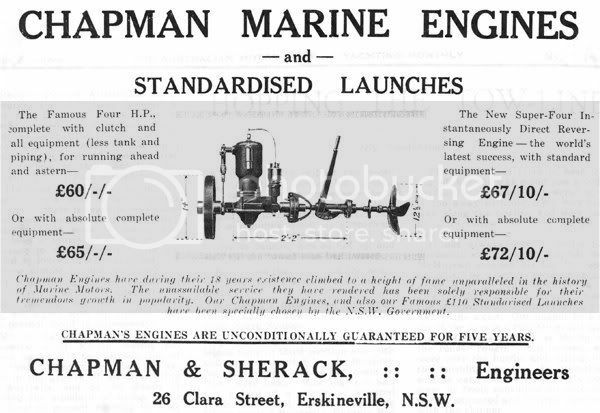 Chapman contracted timber boat builders all over the place and sold them using his name to facilitate sales of the Chapman/Sherack (later Blaxland etc) engines. Better shot for your reference . "I'm sorry, but this is highly classified information. " May I say that any information on, or off the Board, is of interest to everyone who is on line at any time. Whatever the Topic, and as such should be put up front for intelligent discussion and or ridicule as deems best. Yes, We did PM but I was not expecting that kind of comment so early on so, below, is what that was all about between us for other members. My big interest is the history of Australian engines and tractors. So, I have done quite a bit of research, though some of the results are rather meagre. I am not all that interested in outboard motors and boats per se (thought I have no personal grudge against them! ), just the engines that power them. John Holmes, who goes under the name Blitzen, has encouraged me to look into the Riptide numbers. He has one or two himself. I have to say that I wasn't too hopeful of being bowled over with loads of replies, as this forum is pretty quiet. Before getting on to this forum, I had not heard of a Sea Scout. The only ones I had seen advertised were the Boatman, Fisherman and Sportsman. Was the SS just a cosmetically changed model? Leonard Frederick Sheltrum, trading as Riptide Motor Co, applied for TM reg. June 1956. Plenty of room for growth there! I have an unrestored Seamaster and Seasprite outboard, plus a Fieldmaster engine. There was no deliberate attempt to collect only Ameco products, it just turned out that way. My collection of marine engine literature is also rather small. Looking at my marine instruction/parts book list, and that includes Caterpillar, and other heavy inboards, it only totals 30. The agricultural/industrial list is many times larger. That's probably enough for now to get the conversation started. Thanks for the interest in Riptides Mate, the info you included is basically correct. Sportsman had a prototype 12.5 Hp , there were ten hand made. Merc USA had them destroyed as they thought they were a direct copy of one of theirs and proceeded successfully through Australian Courts to have them stopped . (Mark 40) This is 1960 or so. The detail visually, badging, machining modifications and general differences in dimension and gearbox/props tends to confirm. The Fuel conector to the motor was different as well. I have number 9 of that ten made. It was out of the factory at an engineers/ home by all accounts. Missed the crusher. My Baby under rebuild. It does run perfectly but when I pulled it apart the water pump impeller (Different with three piece drive shaft) and pressure grommet (Different location and BIG) was stuffed just through sitting for ages. Still in bits at this time. C.P.C. carb is larger bore as well. Yes SS is for the sea scout which was your average Fisherman dressed up towards the end. It was rope pull, not recoil. Tanks stuffed up reall quick as I mentioned. I have three. One just legible Decals which gave me the indication of things afoot for further investigation. I do not have a complete Boatman yet, just bits but I have many examples of everything else. One will turn up then set is complete. Ignition was always Wipac Pacey for all of production runs. UK import which kinda defeats all Aust except the carb. Fisherman late 50s running here for something to do one weekend. They had 3 types of prop specs as well. Picked at random from my collection. I have a couple of Seasprites, one is original with legible decals still on the tank and is a sweet runner. lovely aluminum, brass fasteners and bronze and stainless fittings. What a machine! My favorite outboard Mate! I have a couple of hundred various makes but it is special to me. I have many vids on You tube at http://www.youtube.com/user/alectraproject and I am a member of A.O.M.C. America and on the panel at http://www.saving-old-seagulls.co.uk/forum/viewforum.php?f=2&sid=c987fd7a443c1acfbdc4e66da841547c. I also collect various old lawnmowers, small power engines, vintage model engines, older radios, Hi_Fi gear, manuals, magazines, memorabilia, service tooling, technical manuals, tune up parts and other related stuff. List is endless. I was born later than I identify with. I will phone you this weekend for a chat Mate. From now on we swap information on the Board OK? Everyone gets a hit then. Thanks Neil for the extra photo. That plate is a nice bit of memorobilia. As my Super 4 guess was wrong, what is the difference between one of those and a Super Pup? According to my research notes, the Super 4 goes back to 1926, the year the Pup was introduced. The first Super Pup ad I have found is dated 1934. As I have seen no company records, all I have to go on is advertisements in magazines. These are not always proof, of course. So, do you know if the Super Pup an updated Super 4 or a new model? I just realised that we are talking inboards on an outboard site. To make amends, I will start a new Chapman outboard thread. Yeah I occassionally drop in a few bits not related to the main topic but I have'nt been banned yet ! I trust the lads don't mind something similar but different ? As to your question ,I have NEVER heard of a Super 4 but likewise can only go by old brochures etc which I have .Would be pleased to get some more info from you . Neil, you are a lucky man if you have old brochures. I have been collecting brochures on things mechanical for decades, and marine stuff has been very hard to find. I was wrong about the Super 4 date, it goes back to May 1925, the date of the attached ad. It appears in ads a year or so later, but the trouble is that not all engines in the range were advertised, so they are a bit hard to date. It looks like the "New Super Four" was in addition to the "Famous 4hp". I've looked again and still nothing on the four . Thanks for that pic . I'll contact direct and see if you want any info I have .You're more than welcome .